When I got the CR-V review unit, I wasn’t disappointed. 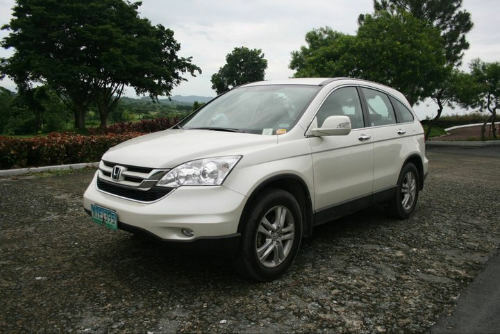 The unit I reviewed was the top-of-the-line 2011 CR-V 2.4 liter all-wheel drive, which came in brilliant white pearl (BWP). While not as luxurious as the Nissan Teana we reviewed last month, the CR-V was quite capable as a family car, and did not complain when pushed to its limits. Most of my latest test drives involve driving around in hilly and winding roads east of Metro Manila to test handling, response and engine power. 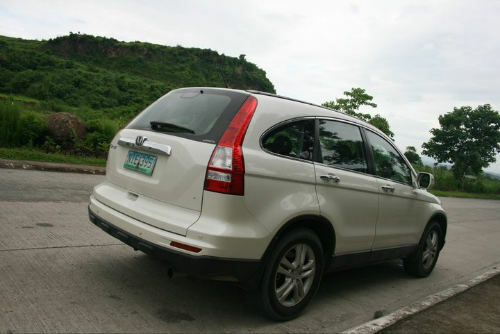 This time around, the family also took the CR-V for a spin through Tagaytay City. 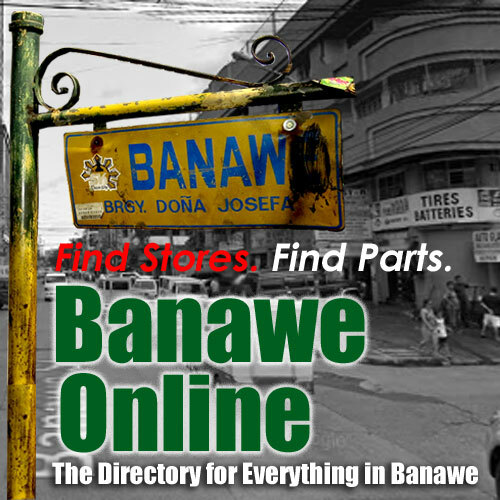 We tried routes we haven’t tried before, particularly the C-6 road that traverses the northern coast of Laguna de Bay and leads straight to the Bicutan exit of SLEX — considered the “shortcut” from the east (Antipolo, Taytay, Angono) to the west or south, as it has access routes to Taguig, Makati and Paranaque. Honda CR-V 2.4 li 4WD front profile. Laguna Lake in the background. 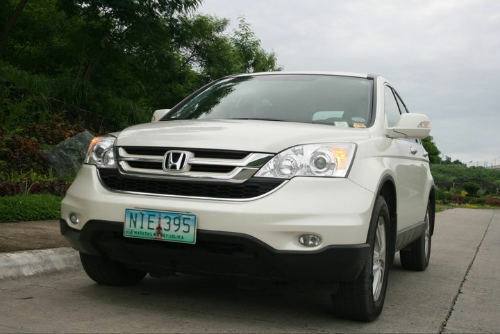 The CR-V is a very capable utility vehicle, considering our review was done right in the middle of inclement weather. The 2.4 liter i-VTEC engine doesn’t even complain when going uphill, and you get adequate engine braking going downhill. At the highway, even a light foot can get you from zero to highway speeds in reasonable time. You’d only have to floor the pedal when overtaking hard. This particular model’s front-end caster angle was said to have been adjusted from the previous (pre-2010)’s to improve handling and driving dynamics, especially when making quick turns and lane changes. If I can comment on the steering, I can say it’s a bit on the heavy side, which might be an adjustment for someone used to smaller cars with electronic power steering or American cars with feather-light steering feel. The CR-V seats five adults comfortably, with front captain seats (with armrests, thankfully) and with the rear bench seats having independent backrest adjustment. Legroom is good enough both at front and back. 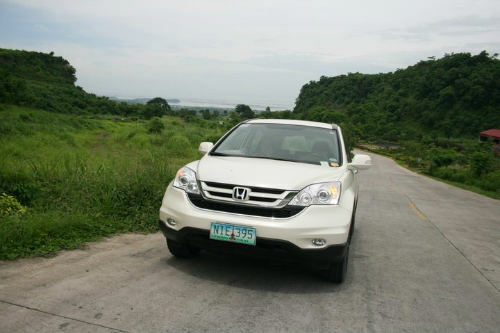 With the CR-V having a monocoque construction and multi-link rear suspension, the ride is noticeably comfortable compared to a truck-based SUV or a body-on-frame AUV. No jitters and jiggles here. But this doesn’t mean the ride was floaty. On rough terrain, you could go through bumpy dirt roads without as much as a shudder, as we experienced driving through the broken lanes under construction along Marcos Highway. The CRV gives you cupholders and cubbyholes galore, with a total of eight cupholders (or more?) and a handful of small compartments for cards, coins and miscellany. You also get a dual glovebox, with one having that familiar USB plug common among newer Hondas. No iPod interface here, though. But I didn’t have to burn a CD compilation just to play my music. I just plugged in my USB key with MP3 files, and the 270-watt 2DIN stereo system with 6-disc in-dash CD changer read it easily enough. 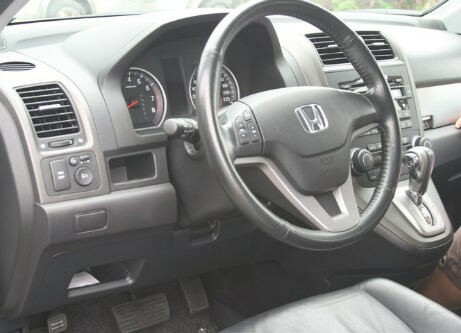 The CR-V’s steering wheel has remote audio controls for easily flipping through tracks or stations. 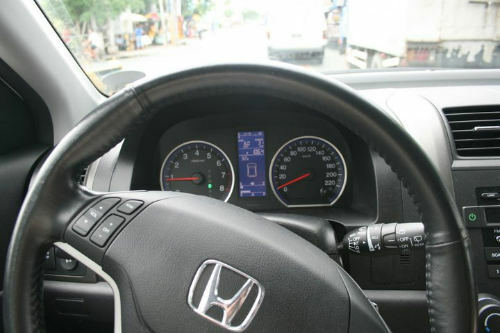 As with all newer Hondas, the CR-V has a multi-function dashboard computer display that outputs current fuel efficiency, average mileage, range, distance traveled, and the like. A bit of difference with previous Hondas I’ve reviewed before though, the CR-V doesn’t suffer from the fuel gauge problem I experienced before. You can load as little as 5 liters and the (virtual) needle won’t get stuck at empty. 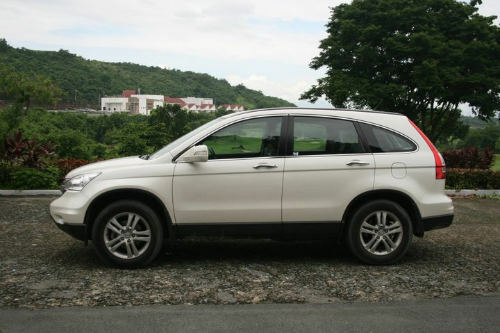 The CR-V is a crossover, so you can definitely expect better utility than with most sedans and MPVs out there. The unit we reviewed came with the double-deck rear storage, which served a dual capacity. You can store items on the trunk bed and you can also place light items on the double-deck. If you’re the paranoid kind, the upper deck covers items kept on the lower deck so that these are kept away from prying eyes, which we found useful since review units are rarely tinted. With a total of 1,010 liters storage capacity when all seats are utilized, or with 2,064 liters with the second row folded down, you could carry three golf bags with all the seats in use, or three kids’ bikes or a couple of full-sized bikes in the CR-V’s various seat configurations. The rear seats fold toward the front to accommodate bulky cargo, and you can also configure the seats to carry long items (like surfboards), while still accommodating adequate space for three to four adults. You also get a total of three 12-volt sockets for your accessories, as well as a handful of hooks and cubbyholes at the storage area. The CR-V sits smack in the middle of various vehicle types from different manufacturers, which will make you seriously consider getting a CR-V instead of, say, a high-end Toyota Innova (budget permitting) or a Mitsubishi Montero Sport. Ranging from 1.2 to 1.5 million pesos, you get a capable utility vehicle that provides just the right amount of performance and just-right utility for everyday needs. It’s not everyday you need to carry balikbayan boxes, but when you do find the need, you’ll appreciate the versatility that a utility vehicle can afford you. 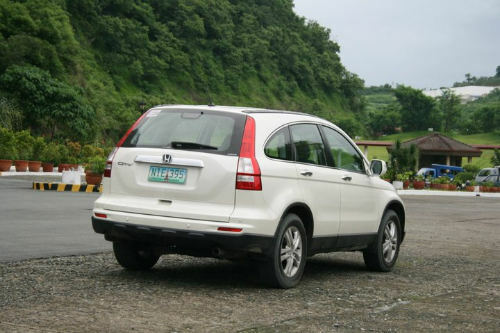 Honda CR-V 2.4 rear profile. See the mountains? We think the CR-V could climb those if we drove it hard enough. In the end, I can say that compared with previous model cars I’ve reviewed before, my family appreciated the CR-V the most. I guess that’s because of the family-orientedness of the CR-V. The CR-V actually services different purposes. You get enough prestige to be a good alternative to an executive sedan. The utility can match a small pickup truck or AUV. The space can comfortably accommodate a family of five. Excellent family car, yet good enough for a discerning executive. Fuel efficiency a bit low. We logged about 10-12 KM/L highway and 6 KM/L city driving. 4WD is not user-controllable, as it’s a “real time” AWD, so it’s not really a SUV for 4×4 enthusiasts. You could disable vehicle stability assist with a button, though. This review was brought to you by car hire UK. Check out the Honda CR-V spec sheet for technical specs. Three words: I like too! Too bad we only spent 6 days with the car. Next up, the Ford Fiesta Sport. wow! a new Honda and also improve for adults. thanks honda!